Peterborough Panthers’ miserable run of injuries and results continued last night (May 26). The city team suffered a fourth successive SGB Championship defeat when they were thumped 60-30 at table-toppers Edinburgh after being reduced to four riders for almost half of the meeting. Already operating the rider replacement facility for absent skipper Ulrich Ostergaard, they lost number one Jack Holder to a knee problem following a heat five spill. The Australian ace was clouted by Monarchs man Erik Riss, but bizarrely found himself excluded by referee Ronnie Allan. That was one of two decisions from the meeting official which irked Panthers supremo Ged Rathbone. He was also fuming to see the previous race awarded as a 5-1 to Edinburgh after Tom Bacon took a tumble on the second lap. And Panthers were then further depleted when Kenneth Hansen suffered a painful exit in heat eight. The Dane, who was already riding through the pain of a fractured breastbone and rib damage sustained in a heavy spill in Sweden last week, withdrew with a hip injury after he was hit by home rider Mitchell Davey leaving the second bend. And that proved be Hansen’s final act in Panthers’ colours as he was later axed by club bosses to make way for new signing Chris Harris. “Jack was clearly wiped out by Riss,” said Rathbone. “It was one of many questionable refereeing decisions on the night. “He has injured his knee, but we’re hopeful it’s not too bad. We’ll assess him this morning and make a decision on whether or not he races at Glasgow tonight. “The crash wrote his bike off and I’m sure he’d be grateful if anyone could help him put it back together. “It is very frustrating that we try to be as professional as we can only to be affected by poor decisions. “We were told at Berwick last Saturday by one referee that a race could not be awarded after two laps, whereas the referee at Edinburgh did decide to award a race after Tom went down on the second lap of a race. “All I ask for is a bit of consistency and for referees to be answerable for the calls they are making. “Referees in kids’ football up and down the country get assessed, yet speedway is a professional sport and we’re not allowed to comment during or after a meeting. Panthers shared the opening three races against the leaders before that awarded 5-1 in the fourth contest eased the hosts ahead. A 4-2 in the re-run of heat five, following Holder’s spill, stretched the Edinburgh advantage to six points. 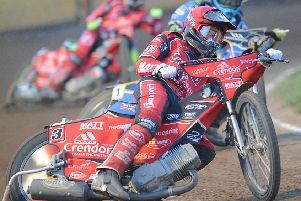 It remained at that margin until Edinburgh showed no mercy to depleted Panthers by slamming in seven successive heat advantages – the final five of them being 5-1s – to finish the meeting. Bradley Wilson-Dean top-scored for Panthers with 11 points gained in a full, seven-ride shift in his final meeting at reserve. Paul Starke also battled well for his nine points. Those two men were the city side’s only race-winners. Panthers were left so short of manpower that they could only send one rider – Wilson-Dean – to the tapes for heat 13. EDINBURGH: Sam Masters 15, Max Clegg 13+3, Ricky Wells 12+2, Erik Riss 11, Josh Pickering 6+1, Mitchell Davey 2+1, Luke Ruddick (guest) 1. PANTHERS: Bradley Wilson-Dean 11, Paul Starke 9, Simon Lambert 4+1, Tom Bacon 2+2, Jack Holder 2 (withdrawn), Kenneth Hansen 2 (withdrawn), Rider replacement for Ulrich Ostergaard.